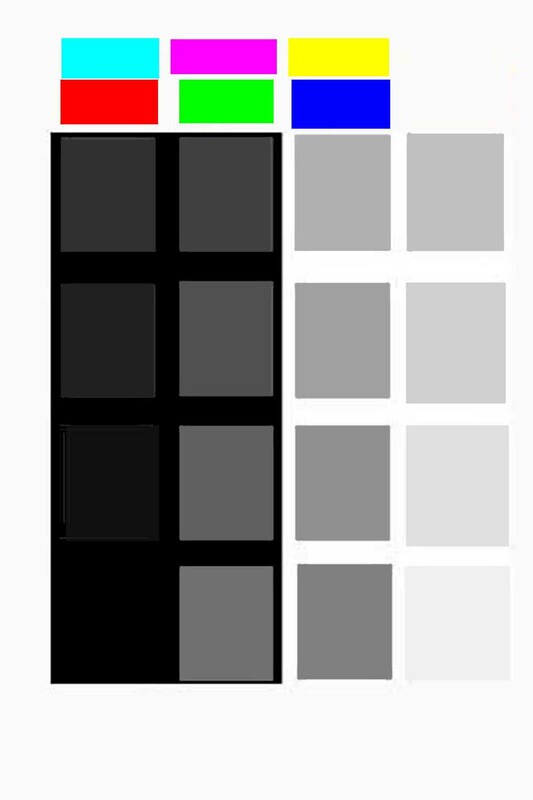 The above file is a gray scale with some color samples. I use this to test my monitor and my printer. The 24bit color system uses zero to 255 units to go from black to white. I created the file using Photoshop Elements. The gray scales are zero to 255 density in steps of 32 counts. When viewed or printed each step should be discernible from the background and from its neighbor. The scales are set on both a white background and a black background to make it easier to judge. Also look for color shift as the scales are viewed. The steps should all be gray. Any coloration thru the steps indicates a lack of accuracy in the monitor or the printer. The colors on top are the 3 primary colors, Cyan, Magenta and Yellow. The colors below them are the compliments. Red is Magenta plus yellow. Green is Cyan plus Yellow, and Blue is Cyan plus Magenta. I like to use Costco for color printing. Sometimes I include a gray scale in my printing order. For example instead of printing an 8 by 10, I print an 8 by 12 with the gray scale on the side. I always have them print with auto compensation turned off.